April 26, 2004, a spring sea ice lead developed along the coast of the Iñnupiat village of Barrow, Alaska, which is the northernmost community in the United States. Near real-time SAR imagery is incorporated into a user-friendly Web interface for use by native hunters and sea ice researchers. The science of sea ice is an ancient discipline for indigenous people living north of the Arctic Circle. Ice science is a matter of survival for the Inupiat Eskimos in the northernmost regions of Alaska whose subsistence depends on hunting marine mammals, including whales, seals, walruses, and polar bears, and shorebirds. More than 7,000 Inupiat Eskimos live along the Beaufort Sea and Chukchi coast of the Arctic Oceanthe traditional lands along the North Slope. For thousands of years, these hardy subsistence hunters have made seasonal trips to the ice edge seeking fish and game. GIS is helping these people better understand and survive in an extreme environment, which is seeing the impacts of climate change in terms of coastal erosion, flooding, permafrost melting, increased intensity of storm events, and so forth. The Inupiats have a vast amount of traditional ecological knowledge passed on from generation to generation. This includes a wealth of terminology for ice and snow and the various conditions associated with them. Hunting parties hike across pressure ridges, sit by seal holes for days, set up temporary igloos to wait for bowhead whales to swim by them, and camp on areas of landfast ice. (The coastal landfast ice extension is sea ice that forms and is often grounded by pressure ridges and remains attached to the coast for much of the winter.) To survive in this region, the people must understand the signs that indicate changes in the environment. For example, they need to know that a shift of wind velocity or a change in the sea current's direction may cause a land extension of ice to break off the coast, which has the potential to strand hunting parties or crush houses. For the last century, western scientists have studied this frozen region of the world hoping to learn more about climate, light, polar ice caps, astronomy, the atmosphere, and so on. The study of landfast ice and pack ice is important for understanding ecology, climate change, minerals management, and navigation. Indigenous people have much to offer western researchers in the understanding of ice science. The National Science Foundation (NSF) is funding a program known as the Human Dimensions of the Arctic System that helps researchers and Inupiats develop a method of integrating traditional knowledge with modern scientific findings. GIS technology has proven to be an excellent tool in cross-cultural communication for discussions that synthesize both forms of ecological knowledge. Allison Graves Gaylord, founder of Nuna Technologies in Homer, Alaska, is part of a team of researchers who received funding from NSF to develop the methodology for incorporating traditional ecological knowledge and western science to study sea ice. Because of global warming, the Arctic pack ice is thinning and coastal communities are more vulnerable to storms and dangerous ice events. A landfast ice extension may extend several hundred meters or kilometers from the coast and act as a platform for both traditional subsistence hunting activities and sea ice research. The sea ice environment is dynamic and even landfast ice can be hazardous and can break into drifting ice floes. Using ArcGIS Desktop software (ArcInfo, ArcView), Gaylord georectifies satellite imagery from the Canadian Space Agency and European Space Agency. She incorporates additional information about Inupiat hunting camps and trails as data layers. Gaylord explains, "Since 2000, I have acquired near-real-time satellite imagery of Synthetic Aperture Radar (SAR) sensors. SAR works both day and night, through darkness and clouds, and produces excellent data about ice. People in the community are very excited about being able to see these images. The Inupiat people say that the ice conditions have become less predictable. The animals behave differently, sometimes migrating at different times and sometimes staying longer. Marine mammals typically travel with the polar pack ice. In recent years, the pack ice has retreated far offshore during the summer and fall months. Polar bears lingered at Point Barrow for weeks while the pack ice remained far offshore. The ice is thinner and less stable. Ice conditions erode earlier in the spring and set up later in the fall. Therefore, landfast ice is not getting grounded and lacks its normal stability. It is dangerous to be out on it." The traditional knowledge of the Inupiat people is challenged by impacts of global warming, which makes the Arctic environment less predictable. 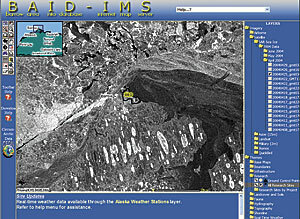 A GIS-enabled Web site, built with ArcIMS, is used to distribute sea ice information to enhance the safety of the community of native hunters and sea ice researchers. 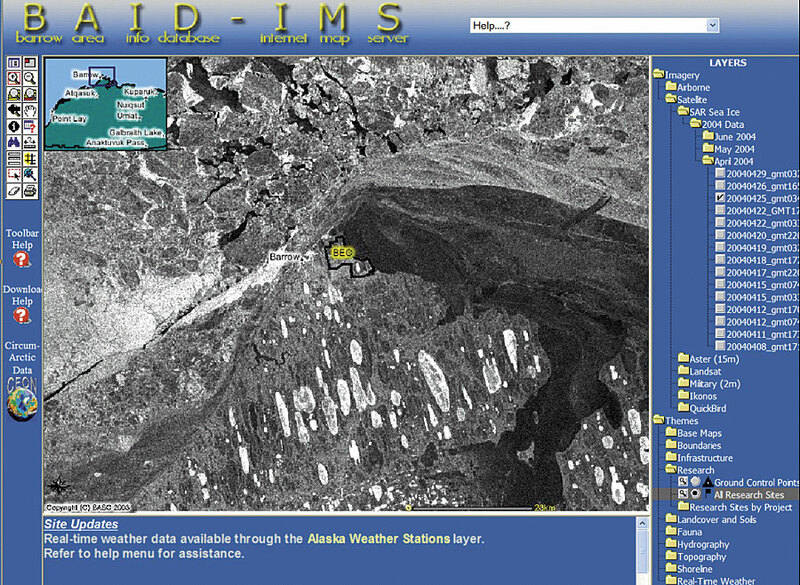 This site, called the Barrow Area Information Database�Internet Map Server (BAID-IMS), is designed to enhance logistics and research planning efforts supported by the Barrow Arctic Science Consortium. Scientists, land managers, educators, and the local community use BAID-IMS to access spatial information pertaining to terrestrial, marine, freshwater, and atmospheric research in the Barrow area. Gaylord says, "The BAID-IMS Web site has been a huge success. It is a resource available to local residents and researchers that are doing work in Barrow. Many sea ice specialists consider it to be a model application for the emerging Arctic GIS initiative. Another project we are hoping to get funded soon is a portal that connects research nodes across the Arctic through ArcIMS technology. Many of the nodes are near native communities similar to Barrow. Web applications can provide access to high-resolution satellite imagery, as well as information about historic and current research activity, infrastructure, landownership data, etc. This would be the beginning of developing an Arctic Spatial Data Infrastructure." The Minerals Management Service (MMS), a bureau in the U.S. Department of the Interior, is also interested in the dynamics of landfast ice. MMS in the Alaska region is a federal agency that has a mission to manage the mineral resources of the Alaskan Outer Continental Shelf in an environmentally sound and safe manner. It is tasked with finding a way to provide the opportunity to explore for petroleum and still preserve the environment and the lifestyle of the people living adjacent to its coast. Naturally, MMS is interested in Nuna Technologies' research efforts and has funded the company to conduct further research in the region. For example, MMS needs to know how spring leads and moving ice packs interact. The seaward limit of stable landfast ice defines where spilled oil might pool under the ice and where fast ice conditions apply to the design and operation of offshore facilities. This landfast ice also defines the furthermost landward boundary of possible whale routes during the springtime migration period. Nuna Technologies has teamed with sea ice specialists from the Geophysical Institute of the University of Alaska to map the average monthly shoreward landfast ice extent. GIS is also used to process datasets to summarize the spatial distribution of spring leads. ArcGIS grids and shapefiles are used to show monthly distribution of the shoreward landfast ice across the Alaskan Beaufort Sea to the Canadian McKenzie Delta. The extent and stability of the landfast ice along this stretch of coast is being analyzed. Remote sensing imagery, specifically Radarsat synthetic aperture radar and advanced very high-resolution radiometer data, has been analyzed for the time period between 1993 and 2004. This data will be compared with the university's archived data from the 1970s and 1980s. The information from this study of both temporal and spatial aspects of landfast ice is the foundation for improving the MMS oil spill risk analysis. The study meets an ongoing need for future sales policy, oil spill contingency planning, and National Environmental Impact Act analysis. For more information, visit Nuna Technologies at www.nunatech.com.